VITARGO ELECTRO-ENGERGY is an innovative preparation based on the patented VITARGO® formula with added easily-absorbable electrolytes. These special carbohydrates are characterized by high molecular weight and exceptionally low osmolality. They are able to penetrate from the digestive system into muscles instantly. 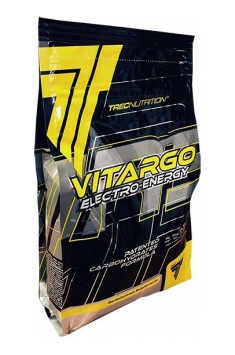 VITARGO ELECTRO-ENERGY replenishes muscle glycogen 80% faster than glucose and maltodextrins. The formula helps improve endurance and enhances intensity of training in all sports disciplines. Pour 200 ml of water to a single portion of the preparation – 70g (2,5 scoop) and mix for 1-2 minutes until it dissolves completely, using a shaker. Next, fill with water up to 700 ml. Depending on the needs, use 1-2 portions a day, preferably before breakfast and 30 minutes before training. It is best to take the preparation around training – 200 ml 20 minutes before training; during effort: in case of training shorter than 60 minutes 100-150 ml every 10-15 minutes; in case of training longer than 60 minutes 100-150 ml every 20-30 minutes; 30 minutes after training (50-70 g of the preparation + 500-700 ml of water). Do not add sugar or other sweeteners. Acidity regulators - citric acid, malic acid; fragrances; sweetener - sucralose; dye - beta carotene.